Date & Time Details: This retreat begins with a mandatory registration period from 2pm to 4pm on the first day and ends after lunch on the last day. This will be an expansion of teachings on Machig Labdrön’s Garland of Jewels (Rinchen Trengwa) chöd tradition offered last April. This retreat is open to everyone, as Lama Karma will be giving transmission again, and there will be extensive teachings and practice. 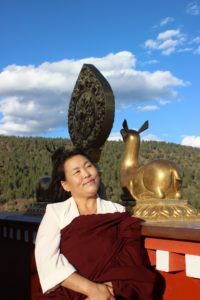 In this retreat we will continue to learn how to practice and perform the rhythms and melodies of the extensive Garland of Jewels sadhana, according to Khandro Tsering Drolkar’s experiential instructions. In particular, there will be detailed teachings on how to perform the series of retreats that are central to this tradition. First, there is the 100 day and 100 feast retreat utilizing the main Garland of Jewels sadhana. 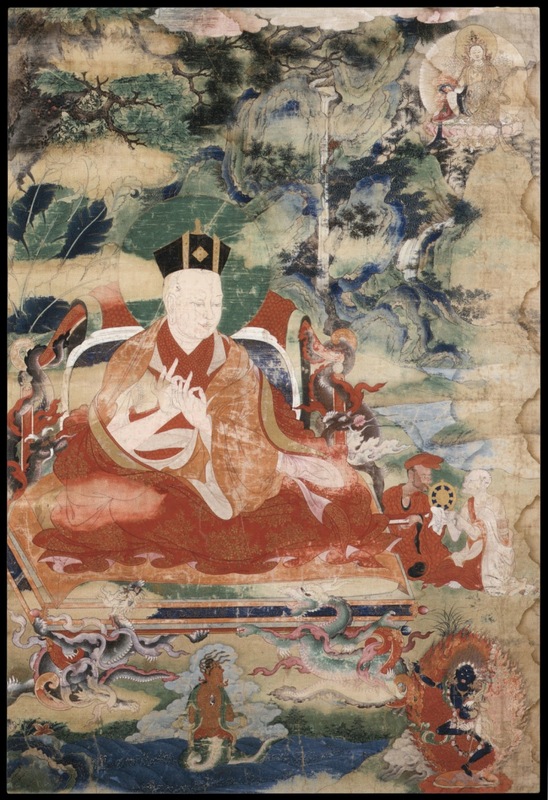 Second, there is a three month retreat utilizing Karma Chagme’s Opening the Door to the Siddhis of the Method to Accomplish the Instructions of Chöd on One Seat. Third, there is a seven day roaming retreat focusing on merging the previous instructions with Secret Yogic Conduct. Fourth, if practitioners are ready, to enhance our realization, there is a 108 day One Hundred and Eight Springs retreat that we do roaming near bodies of water. Lama Karma himself has completed all of these retreats and will offer experiential advice. Along with these experiential instructions, Lama Karma will use a number of commentaries, including the Secret Path of Ten Million Dakinis: Machig’s Complete Explanation, to reveal the outer, inner, and secret meanings of Chöd practice. Lama Karma received this transmission along with rare detailed oral explanations directly from his root teacher Lama Naljorpa. This Garland of Jewels retreat is an amazing, extremely rare opportunity to receive the extensive heart of the living Garland of Jewels oral chöd lineage that comes directly from the primordial wisdom dakini Machig Labdrön. On December 21st we will join together for an afternoon and evening celebrating the Winter Solstice with Lama Tsultrim. See here for more details of this event. You do not need to book separately for this as it is included as part of this retreat. Participants will need to have a Chöd drum and bell, both of which can be purchased in the Tara Mandala Dakini store. A 4-wheel or All-wheel drive vehicle is absolutely necessary to access Tara Mandala in winter conditions. We are pleased to announce that the Dentog Chigma, “Liberation on One Seat,” sadhana will be taught on the last few days (Dec 18-22) of this retreat. Dentog Chigma is the main sadhana practice within the Rinchen Trengwa, “Precious Garland,” the collection of practices in Machig’s Kama (oral) lineage compiled by Karmapa Rangjung Dorje and Karma Chakme. 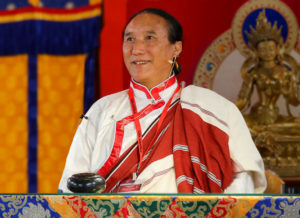 This sadhana is “at the absolute core of Machig’s lineage” according to Lama Tsultrim Allione and is required for those in Magyu before attending Kapala Training Level 4. The profound practice of Dentog Chigma, “Liberation on One Seat,” combines the melodic and rhythmic aspects of traditional Chöd with the visualization and mantra recitation of deity practice. The practice taught on this retreat uses the same text as Lama Tsering Wangdu’s Dentog Chigma practice. Therefore, it fulfills the Dentog Chigma requirement for the Magyu: Mother Lineage (it is a prerequisite for Kapala Training Level 4). Participants may choose to either attend just this Dentog Chigma retreat (Dec 18-22) alone or attend the entire Rinchen Trengwa retreat from December 7-22, which includes 11 full days of teachings/transmissions on the Rinchen Trengwa, and three full days of teachings on the practice of the Dentog Chigma.